These hand held mirrors have long 12 in handles that bend easily. This feature makes them ideal for self examination. 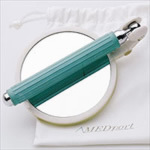 These self-inspection mirrors also have an adjustable hand loop that provides a firm grip. The small mirror is 4 ½ in square, and the large mirror is 5 ½ in square.